Well, I am headed to NEW YORK CITY in two weeks. I am debuting this new extension of my company and brand. 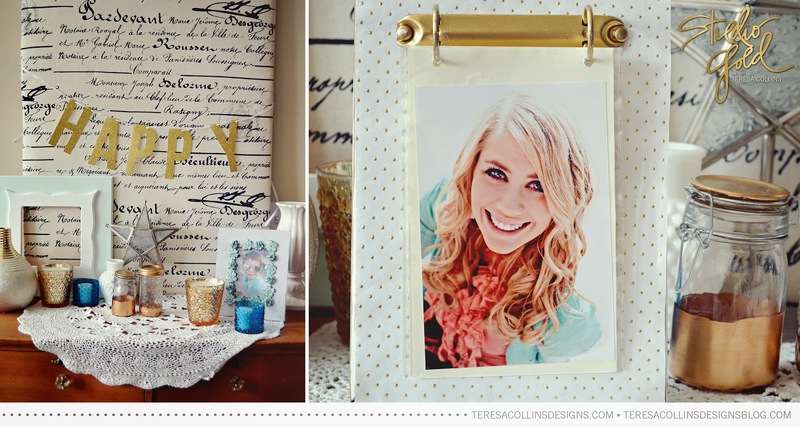 STUDIO GOLD: HAPPY BANNER, STUDIO GOLD: PHOTO POCKET FLIP UP WITH EASEL BACK. I can't believe it is finally time to share some wonderful news. of my designs. With my background in interior design, I knew that eventually I wanted to expand my company into the world of stationery, gift, office, and home decor. some signature selections of stationery, cards and more. do it with a determination and reflection of all of those goals. So with much excitement and a lot of sleepless nights, I decided a few months ago that with the success and growth within my company that it was time. I could not sleep and I designed for days on little sleep. I will be debuting STUDIO GOLD by Teresa Collins at the NEW YORK National Stationery Show at the Javits Center May 18th. products. I am in love with my friends at Fiskars. I truly feel like the luckiest designer in the world to have the opportunity to work with them. *Studio Gold Teresa Collins with Fiskars will be revealed LIVE from the NYC Stationery show. *sorry to all the UTAH crafters. All the gold spray paint needed for my mock ups did cause a vast shortage of metallic spray paint. I confess it was me hoarding and buying it all. I wanted to debut a stationery line of TC albums and cards with STUDIO GOLD with the AME system. I will tell you that photo albums will never be the same. You will see albums and sizes debuted that have NEVER been done and with unique materials. I know that We R Memory Keepers went with my ideas and made them a reality. I would be very unappreciative if I did not THANK them for going 1000% on my designs into this market. I remember going to their offices and I set up a STUDIO GOLD huge table of my vision and direction to debut in NYC. I loved that the men in the room said that they LOVED it and wanted to be apart of my vision. Make sure you watch HSN on June 11th! It's a HUGE day for me. products I know you have NEVER seen before. Just know... your imagination is your only limits. and sometimes they are pure GOLD. 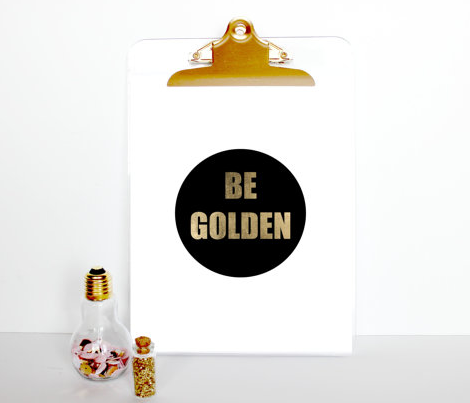 *STUDIO GOLD will be available for retail sale at all crafting stores. Make sure you ask for it and let the stores know you would like them to carry it. Wonderful news Teresa! So happy for you that your business is growing in such a positive direction. I know everyone will love it and Teresa Collins Designs will be the new gold standard! Congratulations! thank you so much. I am excited. Looks great. Can't wait to see it locally...and on HSN. business and looking forward to seeing the products. Congratulations Teresa on all of your wonderful accomplishments. You deserve all the good that is coming your way! Silver was actually always my color. BUT through thee I Love GOLD !! I can not wait to get the new gold treasures in Germany. Congrats on the upcoming new release!!!! very exciting, I will be looking for it. EXCITING & GOLDEN times - wishing you EVERY success!!! Everything you touch turns to GOLD, Teresa! I think that you are one of the most talented designer out there and I can hardly wait to see what you have come up with. I know that you will have a huge success with this area of your designing. Teresa, this is such exciting news!! Congratulations on the launch of this new part of your company! I'm sure everything will be gorgeous and I can't wait for it all to be released! God bless you!! Congrats on following your dream. I am excited to see your new line of products. Oh I can't wait to see it!!! I know it will be fabulous! I hope I will be able to watch HSN when it debuts. I sure do wish you could come to North Carolina to do a craft day. CONGRATULATIONS Teresa, you are such a sweet person and a real inspiration to us all. Oh Teresa what excitement you have created for all us scrapbookers!!! YOU have a heart of GOLD and this creation I know comes from deep within your soul and I can't wait to create from MY heart with YOUR designs!! I am SO very excited for you and your company and can't wait to see you on the cruise!!! YIPPEEEE!! The GOLDEN GIRL goes to NYC!!! You will surely shine with this product line. Wow!! So excited for you and your family.Can't wait to see Studio Gold and I will be watching HSN on June 11th with my cc handy! The love, time and energy you put into your products shows!! So excited for you! CONGRATULATIONS! I cannot WAIT to hear more and see it ALL! thank you. I cannot wait to show more. Exciting, Ill take one of everything! Thank you. I think the 11th is going to be amazing... a long 24 hours... like Christmas for me. Hopefully EMI will get this line!!! Yes, absolutely. I wanted it to be available and marketable worldwide. you just might be reading my mind. Studio Gold is a brand of mine and will be evolving and growing. I can't wait to see you my friend. THANK YOU. So touched. Yes, the cruise will be GOLDEN!!!!!! I would love to see STUDIO GOLD everywhere too! I love love love your excitement. I already got a email from NZ distributor- Michele. I plan to introduce it worldwide. I am so excited and can't wait to show you more. Thank you for your encouragement. I truly hope for this too... I always say "failure is not an option." I have put my heart into it. I have great HOPE for it doing well. Andrea- I miss you! I love GOLD but I still love silver too. No worries... you can mix them both. It's beautiful together. I hope to see you again when I come back. Tell your sister HI for me. Thank YOU! GOLD times are ahead. Pam, it's girls like YOU supporting me and encouraging me like this... that truly keeps me going. THANK YOU!!!!! THANK YOU. I knew it was the right expansion and I am so fortunate to do what I do. thank you. life is too short not to pursue those dreams. thank you so much, Carol. Susan is amazing and she carries all things TCD. Just tell her and I know she will get it all. I can't wait to go back to EMI next year! How awesome!!! Congrats to you, can't wait to see it all! Congrats Teresa on Studio Gold! OMG I can tell I'll want everything as usual! Can't wait for the HSN show in June. I think you need to stop into Whim So Doodle there in St. Pete so us locals can see and touch the new stuff live! I would love to meet you and be present at the reveal of "studio Gold" at NYC stationery show but I heard this is not open to public or is it? Ohmygosh Teresa how exciting!! Me and Heather were taking turns at the class on Friday guessing what it might be, and she was right! (I thought it was jewelry. Maybe you should think about that in the future!) I can't wait to own some of your new STUDIO GOLD line!!! AAAHHHHHHH I AM SO EXCITED!!!! I LOVE office supplies and stationary products! Like, it's an obsession of mine. The fact that you're debuting those types of products along with incorporating them into future releases makes my heart go aflutter! Oh. My. Goodness!!! I CANNOT wait to see STUDIO GOLD! I'm pretty sure I'll NEED all of it! Congratulations Teresa! Congratulations :) I am so very happy for you. Your are such an inspiration to so many. Prayers and hugs for you and your family. YOU are going to "ROCK IT" girl like you do EVERYTHNG .....YOU'VE got the "MIDAS TOUCH"
Those are suppose to be GOLD HEARTS at the bottom LOL! Teresa: I am so happy for you! Congratulations on your brand expansion! You are so deserving!!!!! This is the best news for all of us....can't wait to see your new goodies!!! Congratulations Teresa for all things golden. I am so happy for you and I am very anxious to see your products I know that they will be a hit. Everything that you do is so amazing! Wow! Congratulations! Everything you do is so beautiful and you are so blessed to be able to to do what you love and get paid for it :) I wish we had more crafting stores in Houston so I could see and buy your products. Looking forward to June 11th so I can see the line! Please come to Houston sometime! Wow congrats! Can't wait till 6/11. Congrats!! This is exciting news!!!!! Woo-Hoo for Studio Gold!!!!! LOOOOVEEEE IT! and already on our wishlist! This is great news! You should be proud of yourself for growing your brand so big. Looking forward to June 11 to see all the golden products. Congratulations hard work really does pay off. Blessings to you and your family. Congrats Teresa!! Way to go and look forward to all the pics! You go girl! I foresee Platinum coming your way. Very, very proud of you. So looking forward to your Cruise. So super excited!!! June 11th is already blocked out just for you!!! You are so incredible and I'm just thrilled for you--not to mention US!!! :) much love and blessings for a safe and awesome trip to the big apple!!! Congratulations, Teresa! What an amazing new adventure for you! I am so happy for you and I can't wait to get my hands on your new products. I love everything you design! Congratulations! These products sound amazing. I can't wait to see some in person. Teresa, I am so happy for you. Just now getting a chance to read the blog and catch up. I am trying to embrace the gold. 😉 love ya bunches. Looking for the second chance to win the fabulous wood grain embossing folder....I can't express enough how much you have changed my scrapbooking life with all of your tutorials and products you share with us. Wishing nothing but more advancements in your life for you! !